LET THERE BE ROCK! 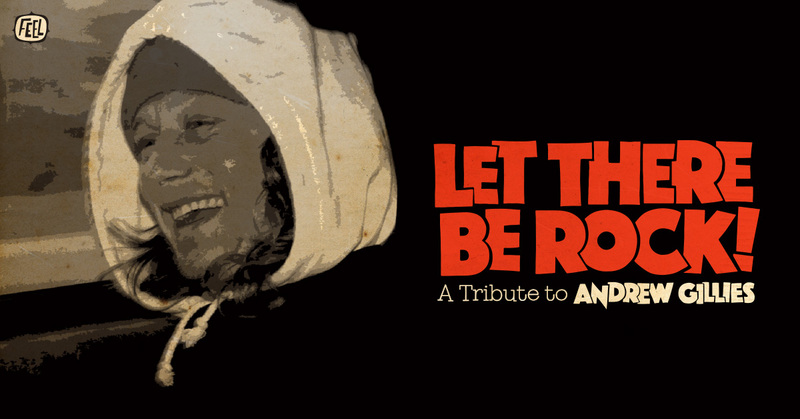 brings together three long-standing heavyweights of the Australian underground rock scene: The Celibate Rifles, Hard-Ons and The New Christs, in celebration of the life of one Andrew Gillies. ‘Gillsey’ as he was more affectionately known, was a fixture at shows by all three of these iconic Sydney acts for over 30 years. The first decade as a resident of Sydney and the remaining two decades as a resident of the northern NSW town of Uki, though, even the tyranny of distance would pose no problem to Andrew’s enthusiasm and drive to see and support his musical heroes. In addition to being a major fan of all these acts Young Andy also served as stage tech for the Hard-Ons touring Australia, Europe and the USA from the late eighties through the early nineties, a role he also commandeered for Ratcat, Ed Kuepper, Died Pretty and others. A slipped disc while working as carpenter reduced his participation in such activity reduced him to more domestic tasks, though, he still continued to tour Europe with his beloved Hard-Ons working as their merchandise seller right up until 2017. Andrew Gillies was hugely loved by all those he worked for but was equally adored by those who only just met him! He was funny, engaging, smart and erudite and he loved people as much as he loved life. Andrew Gillies was a rare breed.